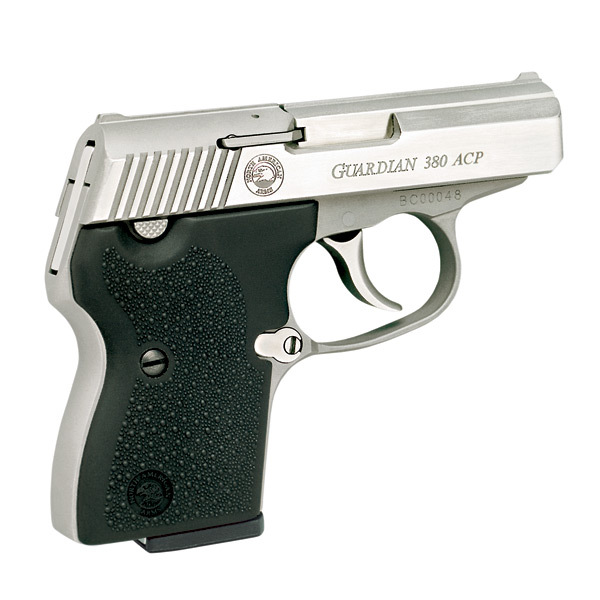 Introduced in 2001, the Guardian 380 ACP is popular with law enforcement and for concealed carry. It offers great stopping power in a small package that fits easily in your pocket, purse, or one of our many holsters. The Guardian 380’s design is based on our best selling Guardian 32 ACP, which was introduced in 1997. Over the years, we have made many subtle improvements to the design, based in part on the many suggestions we receive from our customers. The result is an extremely high quality gun that’s Convenient, Reliable, and very Effective. We stand behind it and back it up with our lifetime warranty. North American Arms has also introduced the Guardian 380S with an Integral Locking System (ILS) (see here in our FAQ’s)safety. The part number for this gun is NAA-380Guard S – please check with your local dealer to order this version of the Guardian 380 ACP.